This Italian Chocolate Praline is covered with dark chocolate, inside classic hazelnut Baci Perugina and it's filled of a delicious cream with cocoa seed. The new extraordinary taste of Baci Perugina Fondentissimo 70% combines the unique sweetness of Baci with the bitter pleasure of a fine extra 70% dark chocolate. But this new chocolate also encloses a sweet secret - inside the intense dark chocolate, a creamy, cocoa centre will surprise all lovers of Baci Perugina. 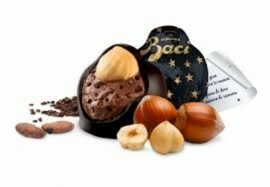 Baci Fondentissimo also remains true to Baci’s signature distinctions - with crunchy whole hazelnuts all wrapped in a love note.